I am having a issue upon trying to call a uk number using a uk sim from this network, i have even done every check through settings to trying through the app with changing the call settings both ways and nothing seems to change. Update: I am able to call USA numbers but not uk numbers even though my sim is from uk with a uk number? I found out that my account is allowed to call USA numbers, but not uk? Even though its a uk sim? Upon review, there are three different accounts under your email address. Which device are you using to try to make the call? The number i have ends in 886692 in which i am mainly using. Upon review, the SIM under that number shows you are running the an iOS device but the premier value added service this sim included for a 30 day trial was deactivated the day to was ordered, 09-28-2017. Removing this entitlement changes the way your device operates, when calling. Without it, your device uses the native messaging and dialer apps only for texting and inbound calling. For outbound calling, they are required to use app, you have to use the messaging app. So your saying that because i cant call any uk numbers is down to the fact i need prem to make calls to uk numbers? Because all i can do is get calls from uk numbers, get sms, and send sms. When i am wanting to make any calls through the app or without the app, it can only call USA numbers to use my mins? Well I am using the app and still the same result with it saying “This number is currently not supported” basicly meaning the basic plan i have don’t support uk numbers, only USA numbers etc, no matter what i do it’s still the same. 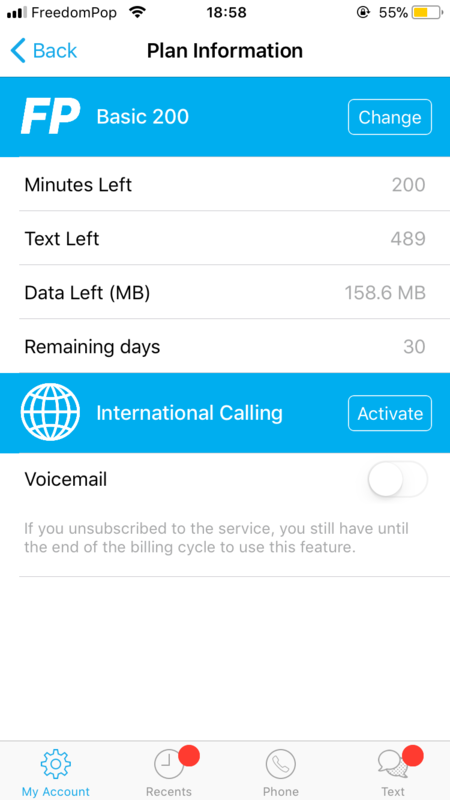 Is the freedompop sim suppose to allow you to call only US numbers with the basic 200 on a uk sim? Or is it suppose to only allow you to call uk only number? Because mine only allows me to call US numbers and it’s a uk sim. I have the exact same problem. Any news on a fix? Yes, i get same issue.